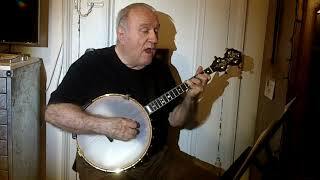 The Manhattan Minstrel Eddy Davis playing and singing a song from the 1964 film "The Americanization Of Emily" starring Julie Andrews and James Garner. It was written by the great film score writer Johnny Mandel and lyricist Johnny Mercer. Davis is playing on his Custom OME 12" head - 17 fret Tenor Banjo. I LOVE film score writers. when I got out of Music School in 1967 I went to L. A.. to get into writing film scores. Every thing was Ghost Writing so I spent some time there, but eventually went on the road with the Betty Grable Company of "Hello Dolly". and ended up in Manhattan where I hooked up with Woody Allen again and did some film score work. So, one never knows does one..
That was just great eddy!